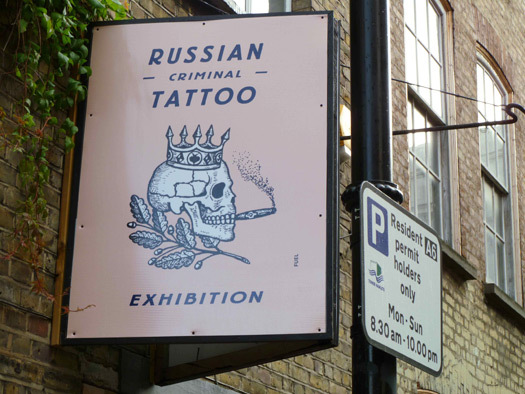 Fuel’s Russian Criminal Tattoo Encyclopaedia, which appeared in 2004, was a shrewdly judged piece of publishing. 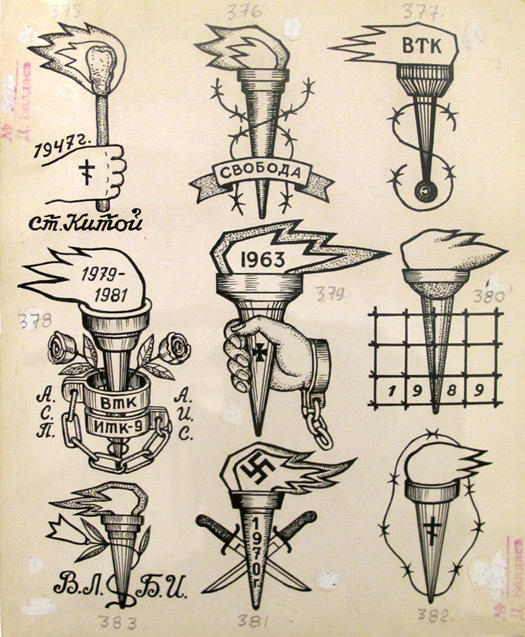 The meticulous ink drawings of tattoos made by Danzig Baldaev, a prison guard from 1948 to 1986, had a horrible fascination for viewers safe in the knowledge that they would never have to endure anything as harsh, perilous and sadistic as the Soviet penal system. Fuel founders Damon Murray and Stephen Sorrell followed up the book with two more equally well produced collections (2006 and 2008) drawn from Baldaev’s archive of more than 3,000 images. Filmmaker David Cronenberg, for one, was smitten. Now, for the first time anywhere, a selection of Baldaev’s drawings is on show in London along with photographs of tattooed prisoners by Sergei Vasiliev. Baldaev died in 2005 and fearing for the archive’s future, Murray and Sorrell acquired the drawings from his widow. 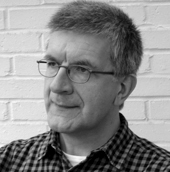 Some London galleries expressed interest in showing them, but exhibition schedules meant a long wait. Seizing the moment, Fuel rented an empty commercial space around the corner from their East London studio and put on the exhibition. I dropped by the day it opened to take a look. The white brick walls and concrete floor suit this brutal material perfectly. Many of the tattoos are grotesque, sexually explicit and obscene. Politicians receive a savage satirical battering. Skulls are everywhere. In the books, the drawings — often reminiscent of Robert Crumb’s — are mostly presented one to a page. 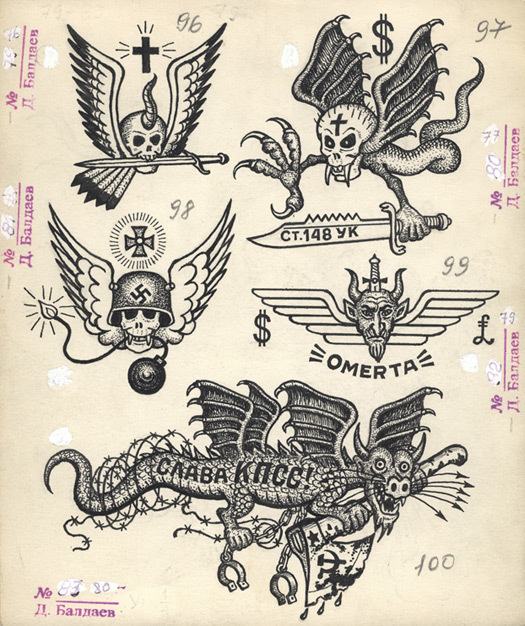 We now see that Baldaev, using visual notes he made while doing his job, would later work up several finished drawings on one sheet, showing similar types of tattoo. These are surrounded by rubber stamps consisting of his name and a filing number, often whited out later, and replaced by a new number in pencil. In the drawing above, the tattoo on the left, recorded in an isolation cell block in 1981, was worn on the hip by a woman jailed at 17 for murdering her lover; the hip tattoo on the right, observed in 1972, belonged to female pickpocket who had studied in Leningrad to be a seamstress. Fuel recently published a fourth volume of drawings by Baldaev, this time documenting the Gulag. It is unbelievably — or perhaps that should be all too believably — grim. They say it’s the last installment in their Soviet horror series, but hope that the tattoos exhibition will attract interest and travel. It should.